While unpacking the Gallery G-17 Air AirPlay Speakers, Klipsch’s first foray into the nascent market for AirPlay-enabled wireless speakers, I admit to being a bit skeptical. First there was the $550 price tag. But the speakers also shipped with a pair of white gloves, included a large mesh cloth stretched across two rods—a part not mentioned anywhere in the manual—and required that I break out a Phillips-head screwdriver for setup. As it turns out, sometimes you do get a second chance to make a first impression—once setup was out of the way (and the cheap gloves disposed of), I came away from the G-17 Air suitably awed. Klipsch describes the G-17's finish as a “high-gloss piano black.” I call it very, very shiny, and it shows fingerprints like crazy unless you handle the unit only while wearing the aforementioned white gloves. (I didn’t.) You can use the G-17 naked, exposing its front-facing speaker drivers, but if you'd prefer a more subtle look, that's where the aforementioned mesh cloth comes in—it stretches across the front of the system, attaching via its magnetic rods. The oblong G-17 measures six inches tall, 17 inches wide, and 3.5 inches deep—if you plan to mount it on a wall, that is. (It weighs 7.5 pounds.) If you instead plan to use it on a tabletop or other horizontal surface, you’ll need to attach the included glass base, which is when the screwdriver is needed. When mounted on the base, the G-18 weighs 8.75 pounds, stands seven inches tall, and is four inches deep. On the right side of the unit, as you face it, sit five buttons: Power, Volume Up, Volume Down, Input, and Wireless Connect. The Input button switches between three music sources: Wi-Fi (meaning AirPlay), USB, and the auxiliary input. The USB port and 1/8 inch (3.5mm) auxiliary-input port sit on the rear of the unit, near where the glass base attaches to the speaker. The USB port lets you connect—and play music from—recent iPods, as well as any iOS device except the original iPod touch, using Apple's USB-to-dock-connector cable. In that same location, you'll also find a Reset button (which makes the G-17 forget any saved wireless settings), and the connection for the included AC adapter. You won’t need to use the Wireless Connect button much—only when you’re connecting the G-17 to a new Wi-Fi network. You can do so in a couple ways. The first is to have the G-17 create its own temporary Wi-Fi network, connect your computer to that network, and then configure the G-17 using a Web browser. The easier method is to use the free Klipsch Air iOS app. You still need to connect your iOS device to the G-17’s temporary Wi-Fi network, but the interface for naming the unit and providing your normal wireless network’s credentials is a bit more straightforward. Once connected for AirPlay playback, I noticed only one AirPlay-related issue, when using the G-17 with iTunes on my MacBook Pro: After pausing iTunes for a few minutes and then resuming playback, iTunes would claim to be successfully streaming to the G-17, but the unit remained silent. Selecting a different AirPlay destination in iTunes and then reselecting the G-17 resolved the issue each time, but this procedure did get tiresome. I didn't have a similar issue when AirPlaying from my iPhone 4S, so I’m tempted to lay the blame on iTunes. That issue aside, listening to the G-17 was a delight. The unit employs a pair of 0.75-inch tweeters (Klipsch describes them as aluminum-diaphragm compression drivers with 90-degree square tractrix horns), along with a pair of 2.5-inch drivers for lower frequencies, enhanced by a bass port in the back. Indeed, I was impressed by the G-17’s bass presence—you could probably fool some listeners into thinking you had a subwoofer attached. The system is also bi-amped, which means Klipsch uses separate amplifiers for the tweeters and woofers. The G-17 can also generate truly astonishing volume without distortion. Cranked all the way up, the G-17 goes beyond room-filling—it’s more like two-bedroom-apartment filling. Klipsch, for its part, recommends you do your listening within 12 feet of the unit, although I found that I could enjoy the G-17 just fine from across a larger room. The G-17 also performs well across music genres, offering precisely the kind of full-spectrum music clarity one should expect at this price. If you'd prefer to tweak the G-17's output, however, you'll need to use the EQ settings in iTunes or on your iOS device, as the G-17 doesn't provide any way to adjust bass or treble levels. The G-17 includes a wireless remote control that offers Power, Input, and Volume controls, along with Play/Pause, Previous, and Next, but the remote's appearance doesn't match that of the G-17 itself. The remote look as if it has one of those thin, clear films—complete with air bubbles around each of the buttons—that you’re meant to peel off once you take the product out of the box. Except that it doesn’t peel off, leaving the remote looking cheap and flimsy. I suppose Klipsch figures that, with an AirPlay unit, you’re less likely to depend upon the remote, since you can control your music from your iOS device or your computer, but given the G-17's price, if the company's going to include a remote, it should do the system justice. The Gallery G-17 ain’t cheap, but based on my experience with other AirPlay-capable systems, this is one case where you’re getting what you pay for. 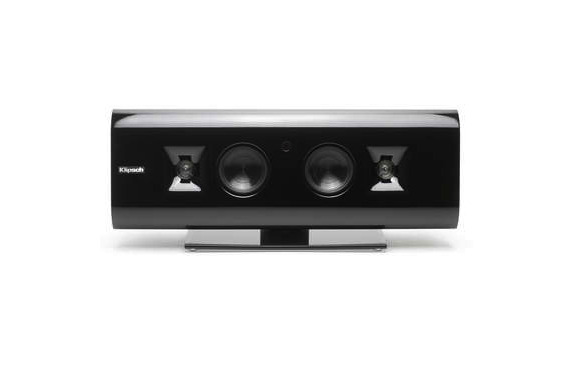 With the G-17, Klipsch has built a stylish, powerful AirPlay speaker system that’s easy to recommend. AirPlay enthusiasts with an audiophile streak won’t be disappointed.